James Wood’s business chose him. Following a workplace accident that left him with permanent spinal damage, James was asked to share his story and saw a demand for this type of training. His business, CNBSafe Safety Speakers, is now a leading provider of sessions using real-life experience. CNBSafe speakers have been involved in workplace injury or fatality. Since 2002, they have shared their experiences to graphically illustrate the results of these injuries and deaths. James and his team work with businesses and organisations of all sizes, the public sector and industry conferences and exhibitions. Clients have stand-alone training sessions or incorporate them into a wider program. Unlike most training businesses, CNBSafe speakers have all experienced or witnessed trauma. “The impact of seeing someone ‘live’ who has had an injury has a long-lasting impact,” James says. James was a diesel mechanic working in the mining industry, but was unable to return to this line of work. 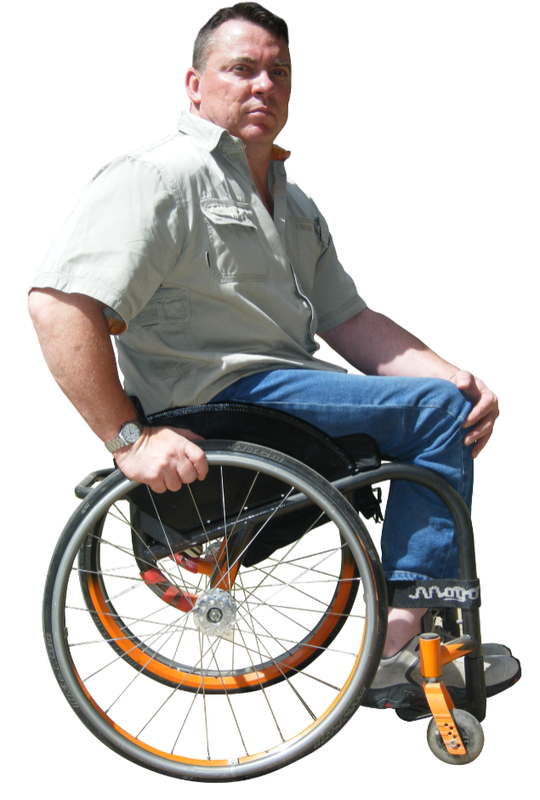 He spent time working in security and manufacturing wheelchairs before been asked to share his story at a workplace. He now runs the business as the Director and keynote speaker. He has two employees and six contract workers. His wife, Vanessa, is the General Manager. CNBSafe Safety Speakers conducts sessions nationally and is known for its customer service and efficient business systems. It has a strong social media presence and produces a monthly newsletter, resource materials and weekly “Woody’s Words” videos. The business was solid and had a good point of difference, but James and Vanessa had not conducted much marketing or promotion. They also had some new ideas that they wanted to run past a fresh set of eyes. After discovering SBMS online and consulting with Yarra Ranges Council, they were matched with mentor Michael Lappen. With more than 45 years in sales and marketing, Michael has a broad range of skills and a dynamic management style that emphasises customer service and satisfaction, corporate planning, staff development and financial control. Michael also introduced James and Vanessa to E Learning contacts, a partner program and insurance market opportunities. He says the sessions provided them with opportunities to improve business growth and greater options for their E Learning program. James has increased direct client contact to build better relationships, and he and Vanessa have thought more about building and not just running the business. They have hired a part-time business administrator who is responsible for the website, search engine optimisation, social media and graphic design, allowing them the focus on business development, client relationships and marketing. Social media engagement, contact with existing clients, bookings and new enquiries have increased, partly due to improved search engine optimisation. James had also been invited to speak at a HSSE construction conference in Brunei. If they hadn’t seen Michael, James and Vanessa say they’d still be “plodding along”. “We have enough working to keep us ticking over but the newfound energy and ideas that we are working on with the help of our mentor has really given the business the boost that it needed,” they say. “Having someone externally look at your business with a fresh set of eyes and no prejudgment or experience is invaluable.